By the mid-1980s, Greenpeace had drifted from the original concept of green and peace — meaning environment and people, [to] save civilization from nuclear war — so we cared about people and had a humanitarian orientation as well as an environmental one. That was the marriage of green and peace, but by the time the eighties came along, the peace had kinda got lost and all it was was save-the-whales and save-the-earth, and now humans were being characterized as the enemies of nature, as if there’s too many of us and there shouldn’t be so many and people shouldn’t have children — and all this stuff that’s still coming up with AOC, now, telling people that maybe they shouldn’t have children because the world’s coming to an end. So I don’t believe any of that stuff. At the highest level, I had to get out of Greenpeace at that point because my fellow directors were all pushing this narrative about humans being the enemies of the Earth. It’s way too much like Original Sin for me, where all the other life is good and only the humans are bad, and I just do not buy that. We’re from nature, just like all the other species are, and humans are mostly good. A few bad people make a big difference, it’s true, but people are mostly good and mostly try to be good. So I didn’t buy that. Moore noted how his fellow Greenpeace directors, at the time of his departure, did not have scientific credentials or backgrounds. “We basically got hijacked by extreme leftists or eco-fascists as they are sometimes referred to today. … We did a lot of good stuff but it went bad,” said Moore. 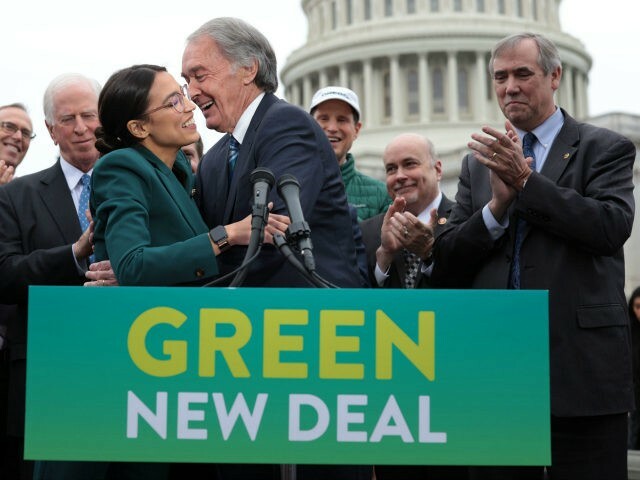 The Democrats might as well sign a suicide pact, not just for their political future, but for the future of the economy of the United States for all these people to be piling on this Green New Deal, which is a complete and utter ridiculous document. To ban fossil fuels in ten years … first, food production would collapse, second, anybody trying to get food into the cities would fail, because the people on the outside of the cities would capture it so they could have it, and the people on the inside is where it would start. The rot would start in the center of the big cities where people would begin starve to death after they’d eaten all their pets. They would actually start killing and eating each other. It’s not just a religion, it’s a toxic mix of religion and ideology, of politics and religion. It’s just absolutely toxic. … They are against humans. Why would humans be against humans? Especially when we have developed such an incredible civilization. Pompous little twit. You don’t have a plan to grow food for 8 billion people without fossil fuels, or get the food into the cities. Horses? If fossil fuels were banned every tree in the world would be cut down for fuel for cooking and heating. You would bring about mass death. “The idea that we’re killing the Earth is crazy,” concluded Moore.